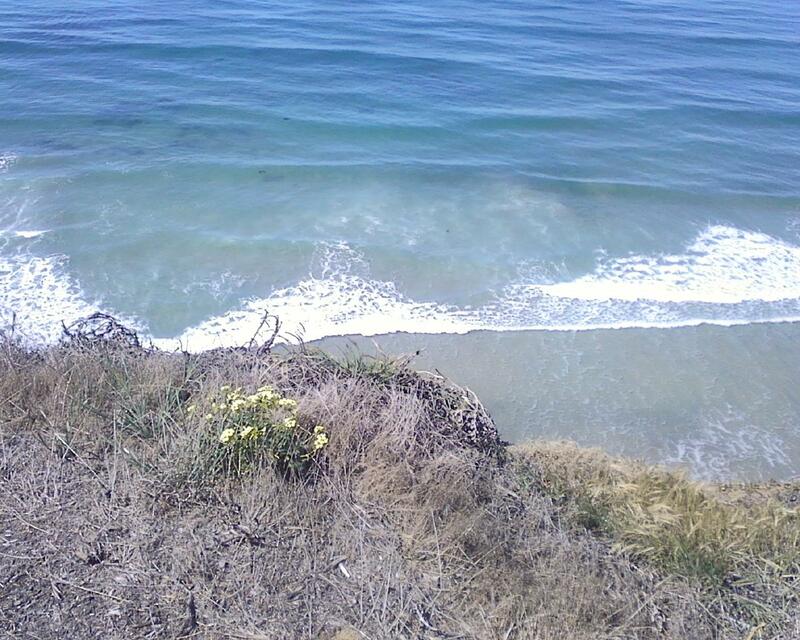 The cliffs overlooking the Pacific Ocean in Encinitas, Calif. I just returned from a beautiful little trip to Southerner Southern California! Not too far away from LA (approximately 2.5 hours drive), San Diego and the surrounding ocean-side cities are super cute! This was my second time in the area, but my first time partaking in its awesome vegan cuisine and exquisite nature. 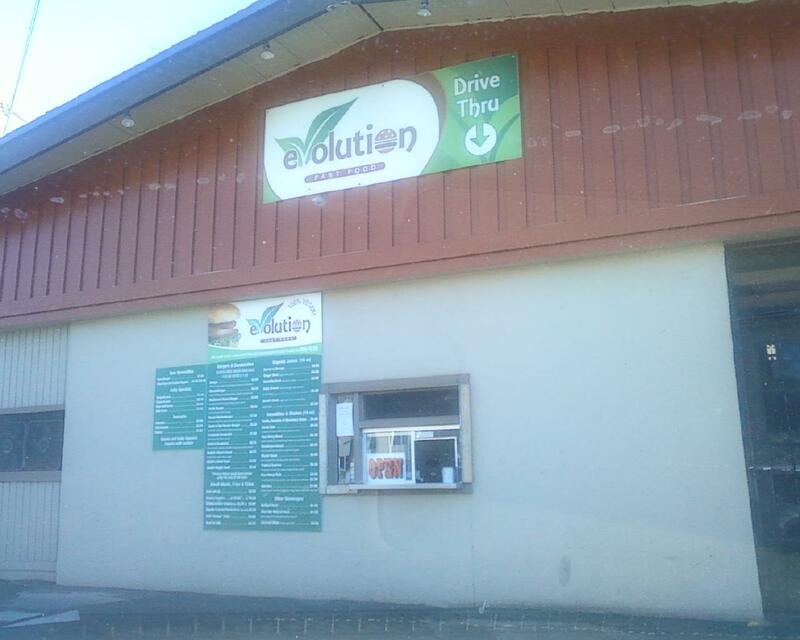 Evolution Vegan, a drive-through all-vegan restaurant in San Diego, Calif. also packages and sells some of their products in grocery stores throughout California. Their restaurant features raw wraps, gluten-free homemade veggie burgers, raw vegan soft serve, juice and soup specials. Highly recommended if you’re in the area–especially if you’re on the go and need something quick! Note: we did not drive-thru when we dined at Evo, so if you have and would like to share about the experience, please do! Vegan drive-thru! Evolution Cafe in San Diego, Calif.
Another gastronomic highlight was Peace Pies raw vegan restaurant in Encinitas, Calif. I absolutely loved the decor, outdoor seating, and very reasonably-priced organic raw vegan food! 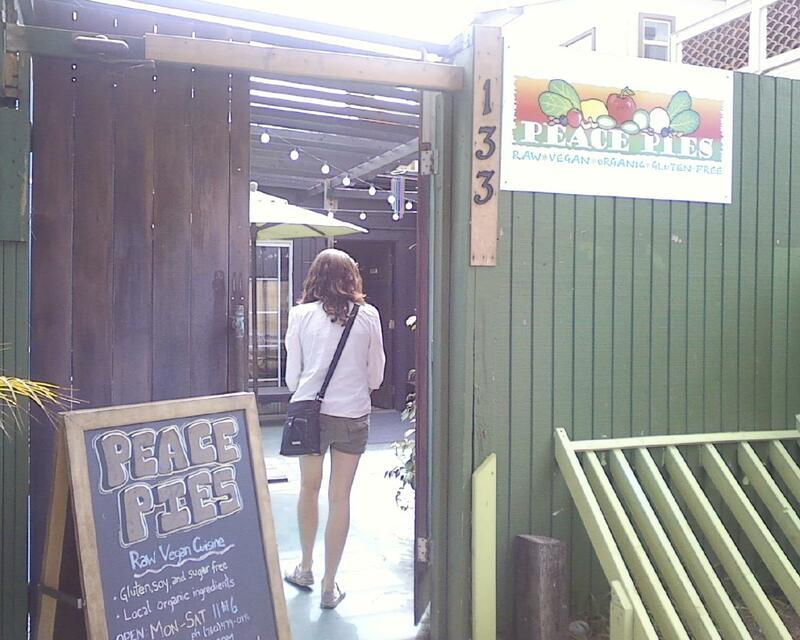 Peace Pies Cafe--Raw vegan food in Encinitas, Calif. That's Courtney walking in! 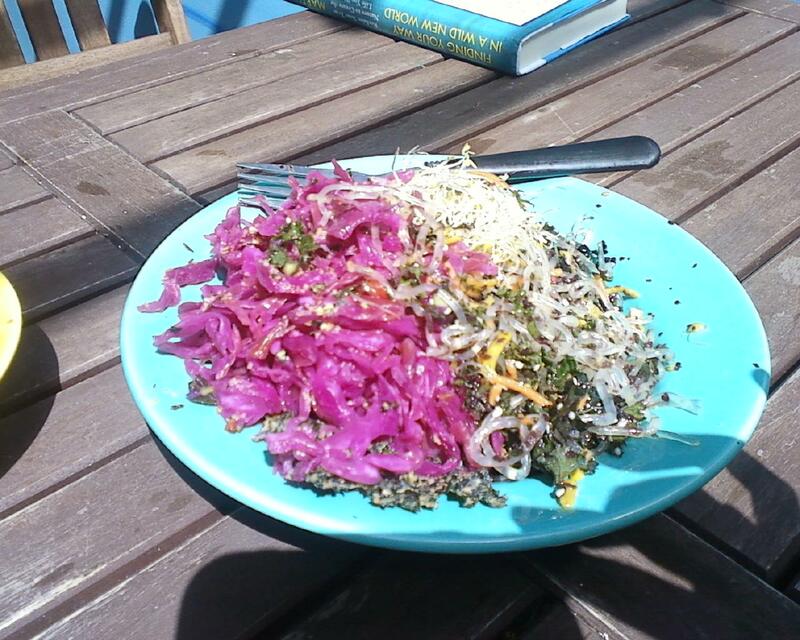 Raw vegan sauerkraut, kelp noodle and kale salad from Peace Pies. 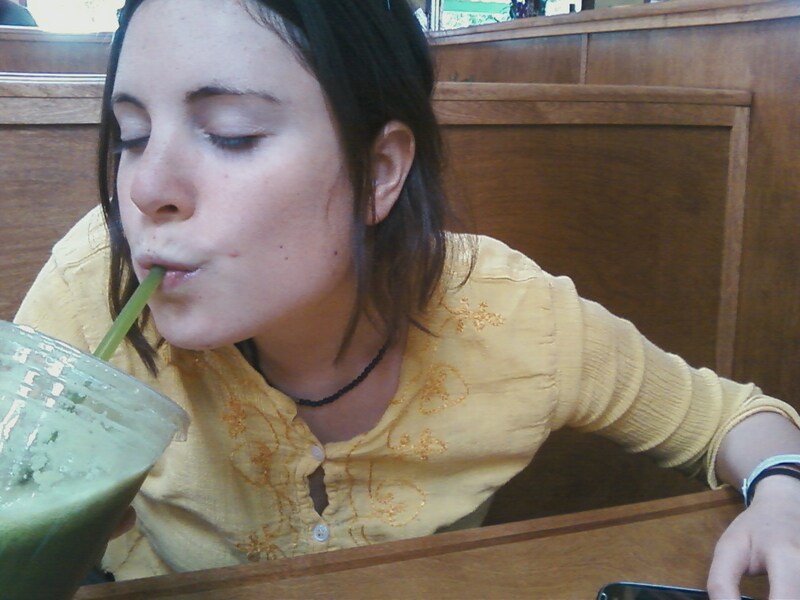 Green Juice From The Lotus Cafe in Encinitas, Calif.
That's me, enthusiastically drinking green juice! 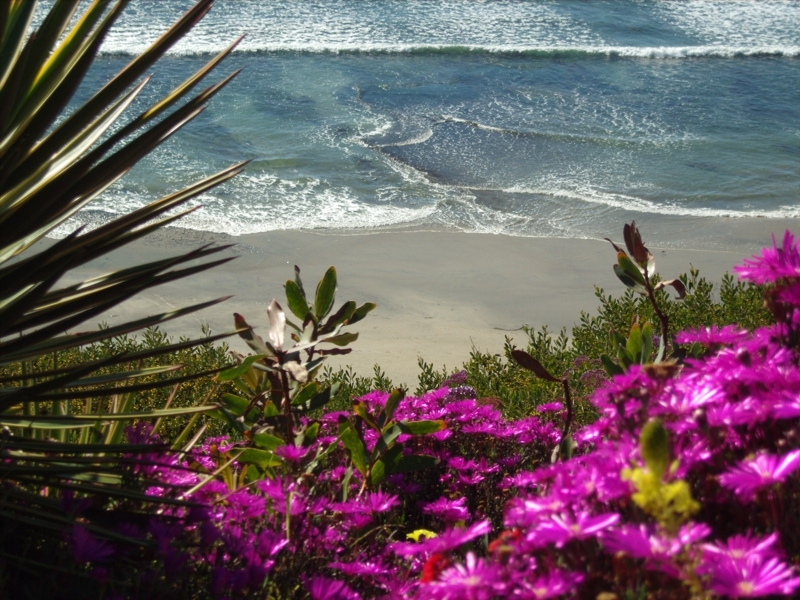 It was also very lovely to visit the beautiful SRF gardens in Encinitas, Calif. and spend time by the beach. The Self-Realization Fellowship gardens overlooking the ocean in Encinitas, Calif. Photo courtesy of Jeff Dowler. 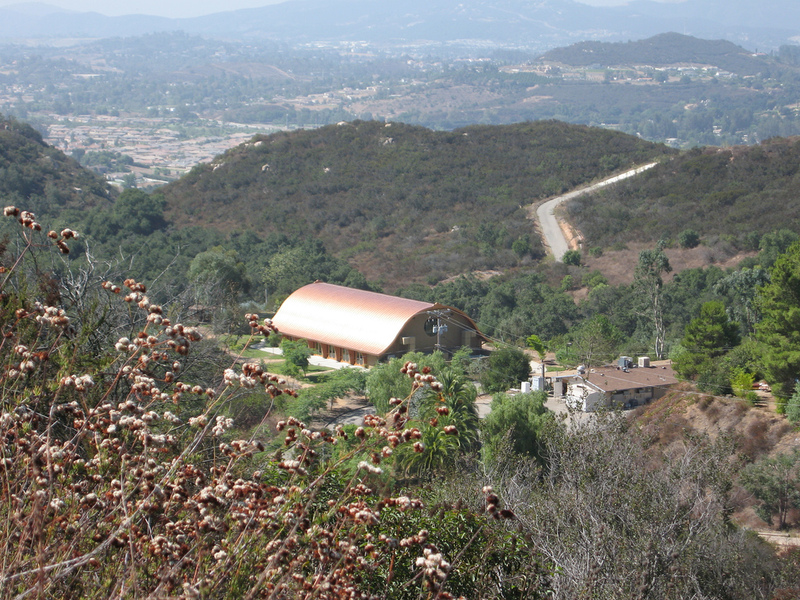 Deer Park Monastery in Escondido, Calif. Photo Courtesy of Wikipedia. At Deer Park, I enjoyed going inwards to enjoy healing silence and nature. Meals included simple Vietnamese vegan dishes like steamed veggies, greens, rice, noodles, and plenty of pho. Breakfast was oatmeal, fruit and almond butter, which is easy to make in bulk and hearty. It was quite nice to enjoy it a few hours after waking up for pre-dawn morning meditations! Thanks for reading! I am now back in LA, enjoying being back in the city and taking with me the peace and ease of the trip. SO SO SO FUN!! I love you!! on March 31, 2012 at 1:13 am | Reply Carrie M.
Hey Sarah… I live in Encinitas now. Glad to hear you enjoyed it! It definitely is a beautiful place. Hope things are going well in LA. ~Carrie M.
on March 31, 2012 at 4:03 am | Reply Sarah E.
Hey Carrie. How amazing is it? Do you eat at Peace Pies? Sending well wishes, friend.